The Vancouver Canucks, with nine of a possible 12 points so far this season, have been a nice surprise this season. But even as the team basks in the glow of a nice start, the elephant (or Russian bear?) in the room is Nikita Tryamkin. The 6-foot-7, 265-pound Russian defenceman is still waiting to get into his first NHL game of the season. 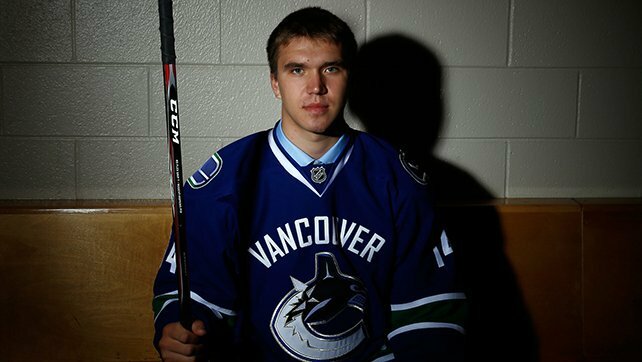 Still just 22 years-old, Tryamkin has a lot to learn at the NHL level. Typically players in his position begin to learn those lessons by playing in the NHL or AHL, rather than sitting in the press box. But that’s where Tryamkin finds himself these days, as the only healthy player on Vancouver’s roster not to appear in a game yet this season. Utica is where the Canucks want Tryamkin to play right now, but the blueliner denied the request. Tryamkin is in limbo, given that he has an out-clause in his contract to bolt to the KHL should the team send him to the minors. He doesn’t want to go to the AHL, and Willie Desjardins doesn’t want to play him (yet) in the NHL. The Canucks’ top-four is set, with Alex Edler, Chris Tanev, Ben Hutton, and Erik Gudbranson fixtures in the lineup. Their number five and six defencemen, Luca Sbisa and Philip Larsen, are less established, but yet the coach has been reluctant to remove either one from the lineup. There were a number of fans asking for Tryamkin to get in the lineup against Anaheim on Sunday, a heavy team, but isn’t that what Sbisa is in the lineup for also? If Desjardins were to sit Sbisa, he would be sitting a player with a $3.6 million contract, and he can’t sit Larsen as long as he’s quarterbacking the first-unit power play. And that’s the thing. The Canucks will get injuries to their back-end. It happens every year. But how long is too long to let a young player sit? Benning cited the fact that Tryamkin has already played four seasons of professional hockey in Russia as a reason why having him sit now isn’t the end of the world. But if by some miracle the Canucks don’t get an injury to their back-end, we’re nearing the point where Tryamkin has to get into a game. If he doesn’t, the danger becomes that the rest of the league gets into mid-season form while he’s still in pre-season form. While Tryamkin isn’t one of the Canucks’ top-six defencemen right now in the estimation of his coach, he could be down the road. Getting him into games right now could pay dividends for the team for the Canucks this season.